With DNN 7.4 coming out on our scheduled broadcast of this month’s DNN Hangout, it only made sense for us to switch things around and talk about the release. There are several nuggets of goodness that the community will enjoy in 7.4. We spent this entire DNN Hangout talking about what went into the latest DNN release and what it means to you. A DNN Hangout wouldn’t be a hangout if we weren’t hanging out with at least one guest. This time, we invited Francesco Rivola from DNN Corp and Brian Dukes of Engage Software. 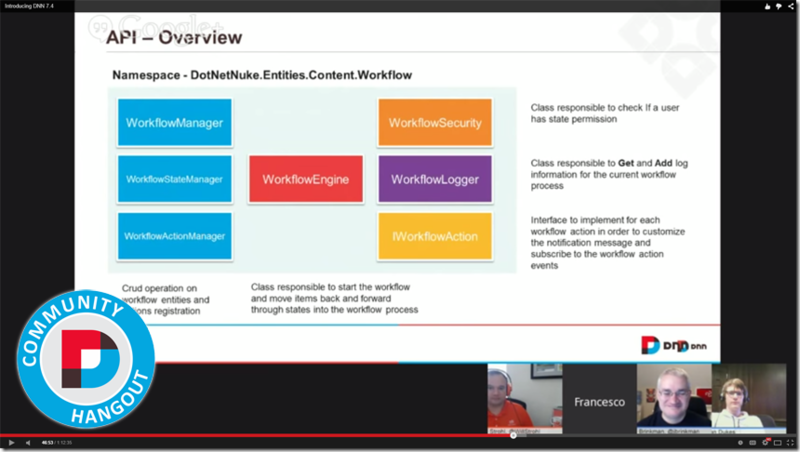 Francesco is one of the masterminds behind the new workflow API that’s available to all extensions in the community. He even goes as far as showing up some code samples and gives examples of how we might want to use it for our own extensions. Jared Shockley was supposed to speak this month, but luckily he was flexible to move his episode to next month. We can look forward to speaking to Jared next month about DNN and Azure. He promises to speak to us about how to leverage the various Azure services in your own applications. Tune in on March 4, 2015 at 12:00 PM (PST). Unfortunately, I had to join the hangout late this month. We’ll highlight this again next month. There aren’t a ton of resources this month due to us not following our standard format. You’ll see that return to normal next month.